The SKY ceiling panels uses the same brilliant LOFTwall panel system and ads hardware for ceiling hanging use. Many sizes, configurations, and color/material options are available. 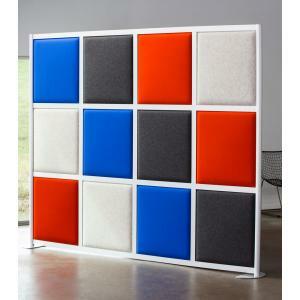 The LOFTwall SKY uses the modular, lightweight, and minimual frame and brings vibrance to your high loft space areas. It's the perfect solution when a permanent ceiling is not feasible or permitted in a space. 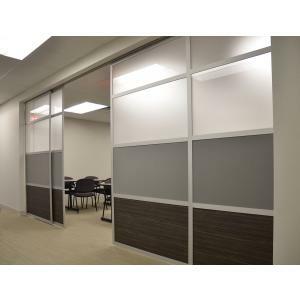 The many various panel colors, wood laminates, and custom options make it great for office spaces and modern loft spaces. Choose from subtle or vibrant color options -see below. . See the whole collection to explore the possibilities! LOFTwall has a green statement and is committed to reducing waste, using eco-friendly materials, and manufacturing dividers in the USA as efficiently as possible. The standard frame color is Natural Anodized Aluminum - which is a matt silver finish. Custom frame colors are possible.